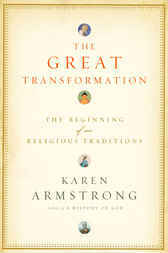 From Karen Armstrong, the bestselling author of A History of God and The Spiral Staircase, comes this extraordinary investigation of a critical moment in the evolution of religious thought. In the ninth century BCE, events in four regions of the civilized world led to the rise of religious traditions that have endured to the present day—development of Confucianism and Daoism in China, Hinduism and Buddhism in India, monotheism in Israel, and philosophical rationalism in Greece. Armstrong, one of our most prominent religious scholars, examines how these traditions began in response to the violence of their time. Studying figures as diverse as the Buddha and Socrates, Confucius and Jeremiah, Armstrong reveals how these still enduring philosophies can help address our contemporary problems. Karen Armstrong is the author of numerous books on religion, including The Case for God, A History of God, The Battle for God, Holy War, Islam, Buddha, and Fields of Bloos, as well as a memoir, The Spiral Staircase. Her work has been translated into forty-five languages. In 2008 she was awarded the TED Prize and began working with TED on the Charter for Compassion, created online by the general public, crafted by leading thinkers in Judaism, Christianity, Islam, Hinduism, Buddhism, and Confucianism. It was launched globally in the fall of 2009. Also in 2008, she was awarded the Franklin D. Roosevelt Four Freedoms Medal. In 2013, she received the British Academy’s inaugural Nayef Al-Rodhan Prize for Transcultural Understanding.